When and where does practice start? Usually the first Monday in August at Harmony Park located at 230 W. Harmony Road in West Grove. Practices normally run from 6PM until 8PM. When will the game season begin? The game season officially begins on Labor Day weekend with our first game. This will vary depending on the team your child participates on, however most seasons run from August 1st until the second or third weekend in November. Will there be any scrimmages before the season begins? Yes, we usually will have 2 scrimmages - one during a regular practice during the week and one on a weekend before the season begins. Until school starts, practices are mainly 5 nights a week from 6:00-8:00PM. Once school begins the practices will reduce to 3 nights a week from 6:00-8:00PM. What if we are away on vacation, can my child miss practice in August? It is expected that all players are at all practices. How many home games will we have? We currently have 4 scheduled weekends of home games (subject to change). What is the difference between varsity and junior varsity? JV teams are instructional teams with no undue emphasis on winning. Is AGW a traveling organization? Yes, most of our schedule will be made up of teams in Chester County. Some games will be played in Delaware County. What does my football player need to buy for 1st day of practice? We will provide your child with a helmet and shoulder pads. 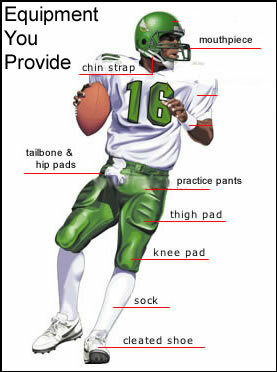 You will need to provide a mouthpiece, cleats, socks, athletic supporter, girdle, pants, a practice jersey and a water bottle with plenty of water. What does my cheerleader need to buy for 1st day of practice? A cheerleader needs a white t-shirt, maroon or gold cotton shorts, and sneakers, hair in ponytail, water bottle and physical. When will my child receive their uniform? Helmets and shoulder pads will be distributed during a week at the end of July or beginning of August. Game jerseys will be distributed after the teams are divided into Varsity and JV. Before my child can practice is a full medical clearance required? A child will not be able to participate in contact or stunting drills until a medical clearance release is obtained from a physician. Do flag football players and cheerleaders get uniforms like the bigger kids? 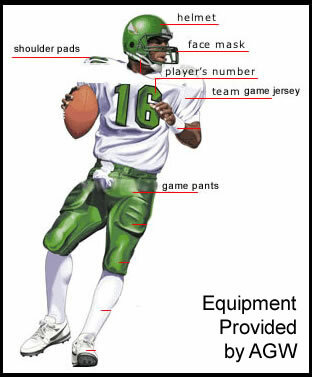 Flag football players will be issued game jerseys. Flag cheerleaders will be issued regular cheerleading uniforms. If you have a question that wasn’t answered above. If you are interested in coaching, assistant coaching and/or getting involved with the Avon Grove Wildcats?